Adversity. Ad-freaking-versity. That’s what North Dakota State’s basketball team has faced this season. Unsurprisingly, that adversity trickled into this season’s Summit League Tournament. But the fight in the Bison kept them alive, and the green and gold have will play in its fourth straight Summit League Tournament championship game after beating Indiana Purdue-Fort Wayne Monday, 69-68. “We kept believing. We kept fighting. We kept controlling what we could control in the second half,” Bison head coach Dave Richman said. “We will evaluate it in the morning and if he understands those expectations, absolutely,” Richman said about Miller’s status for Tuesday’s game. Bison senior guard Kory Brown fouled out with 9:36 left in the second half, and finished with six points, four rebounds and three assists. It could’ve been Brown’s last game in a Bison uniform. And the Mastodons used an opening first half 20-4 run to try and knock NDSU off the court. It didn’t look good for the Bison. But NDSU has embraced adversity all season. After IPFW went 8-for-16 from the three point line in the first half, it didn’t look like a comeback was possible, especially with the Mastodons were leading 36-21 heading into the locker room. But when leading scorer Paul Miller doesn’t play, someone has to step up to score his 15-plus points he averages per game. Freshman Khy Kabellis and junior Carlin Dupree did that and more for the Bison. 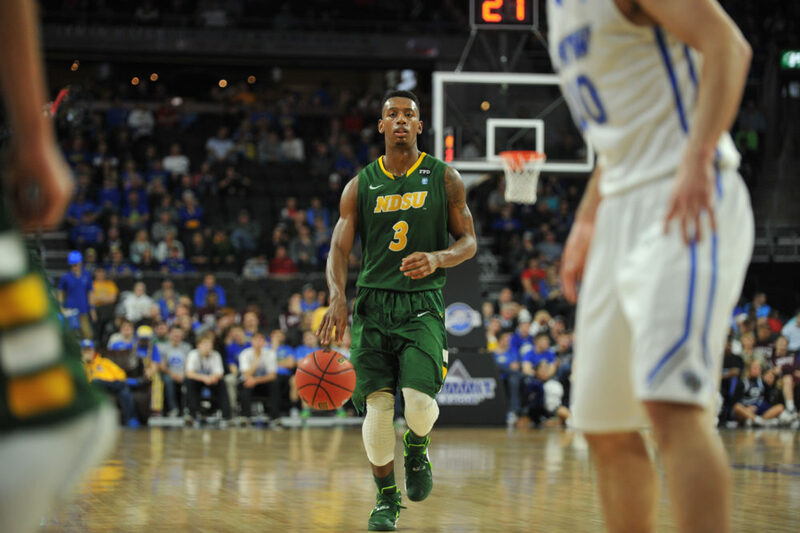 Dupree drove to the lane with and made a layup to give the Bison the 69-68 lead with four seconds left in the game. He stood at the free throw line and attempted to miss his free throw to try and run the clock out, but the shot never hit rim, just the back board. IPFW in-bounded the basketball and the desperation shot by Max Landis was no good. NDSU used an 18-8 run in the last six minutes and scored 48 second half points to complete the comeback. Kabellis hit some deep three-pointers, and Dupree, who quit the team this January and then came back, had two key layups with under a minute to play. “I can’t use profanity (in front) of the mic but I felt like that,” IPFW head coach Jon Coffman said. Kabellis finished the game with 19 points on 6-of-13 shooting and Dupree added 22 points on 8-of-11 shooting for the Bison. No, NDSU wasn’t the favorite to win the tournament this year (or last), so why not another trip to the NCAA Tournament? Tomorrow at 8 p.m. inside the Denny Sanford Premier Center in Sioux Falls, S.D., the Bison will try to punch its third consecutive ticket to the big dance, playing the winner of Denver/South Dakota State.